While few pedestrians tend to look skyward during a brisk walk up Connecticut Avenue, those that do at the corner of Q Street are likely to spot a variety of architectural details with a nautical theme on what was originally two apartment buildings, the Anchorage at 1900 Q Street, and the Moorings at 1901 Q Street. They are the surviving set of what had originally been four apartment buildings at the intersection, owned and managed by a wealthy socialite, Marie Hewitt Williams, the widow of Colonel John R. Williams. Williams’ daughter, Juliette Leiter, resided in a vast mansion between New Hampshire and 19th Street, facing Dupont Circle, where the Hotel Dupont is located today, and just south of the Anchorage apartment building. She started her foray into providing apartments for single and distinguished residents in 1919 by converting two large mansions on Connecticut Avenue north of Q Street that would eventually become the Galleon and the Caravel. The five-story Galleon on the northeast corner of Connecticut and Q was built in 1899 as a residence and office for Dr. Henry D. Fry. The Caravel was built about the same time to the north. Williams hired architect Jules H. de Sibour to design the whimsical Anchorage apartment building in 1924, with a six-foot anchor on the façade, nautical sconces and balcony railings, and working fireplaces in each of the 16 units. Three years later, she hired architect Horace Peaslee to design the eight unit Moorings across the street, with rope trim on the ground floor doorways and a lighthouse-shaped cupola atop the roof that remains to this day. ‘The “Anchorage,” the “Moorings,” and the “Galleon,” –- three prominent, convenient, and modern apartment houses, whose nomenclature is reminiscent of the sea, but which provide safe, comfortable, and pleasant havens for the transient or permanent dweller, the seafarer or the landsman. This triad of fine apartment dwellings, in keeping with the dignity and best living conditions of the national Capital, maintains the home atmosphere and efficiency of service so important to the tranquility of the permanent resident and visitor alike. Carrying out the allusion to maritime life found in the names of the three buildings, the walls of the apartments are adorned with pictures of clipper ships. Open fire places in the sitting rooms, where meals may be served from the private kitchen, add a suggestion of cheerfulness and warmth, enhanced by the draperies of quaint chintz. For many years, the Anchorage housed a French restaurant on the ground floor called Pierre’s that delivered meals to residents of all four buildings, including Williams herself. More than three dozen members of Congress called the Anchorage home while in Washington, the most famous of which would be Sam Rayburn of Texas, who lived there from 1936 to his death in 1961. Others included Robert F. Kennedy, Charles A. Lindbergh, and even Tallulah Bankhead. 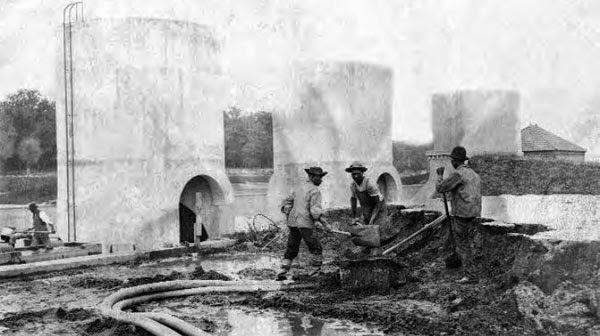 The McMillan Reservoir Sand Filtration Site, bounded by Michigan Avenue, North Capitol, Channing and First Streets, NW has been a curiosity with residents and visitors alike ever since its completion in 1905. The 25-acre site consists of regulator houses, sand bins, washers, and massive underground sand filtration beds that treated and cleaned water held at the McMillan Reservoir before delivering it to individual homes in the city. Its innovative system of water purification led to the elimination of typhoid epidemics and the reduction of many other communicable diseases during its 80-year existence. Early residents of the city were dependent upon local springs for their water needs, with three downtown sections of the city utilizing the City Spring on the north side of C Street, NW, between 4th and 6th Streets; Caffery’s Spring (also known as the Hotel Spring) at the northwest corner of 9th and F Streets, NW; one located on the public space property located at 13th Street, NW, north of I Street; and another further west, near the center of Franklin Park, (now Judiciary Square); and the Smith Spring, now the McMillan Reservoir itself. In fact, the earliest documented instance of water being piped throughout the District’s streets for public use was in 1808, when the city permitted residents living in the 600 block of Pennsylvania Avenue, NW, to “convey” water from the city spring to their neighborhood via pipes fashioned from hollowed out trees that were sealed end to end and buried under the street. In 1850, the Potomac River was identified as the District’s principal water source in a congressionally funded engineering study to determine the most available mode of supplying water to the expanding city. The study was overseen by Lieutenant Montgomery C. Meigs, who later served as Quartermaster General of the Union Army; he is credited with planning and building the structures and facilities that would eventually become the Washington Aqueduct, which first became operational on January 3, 1859. 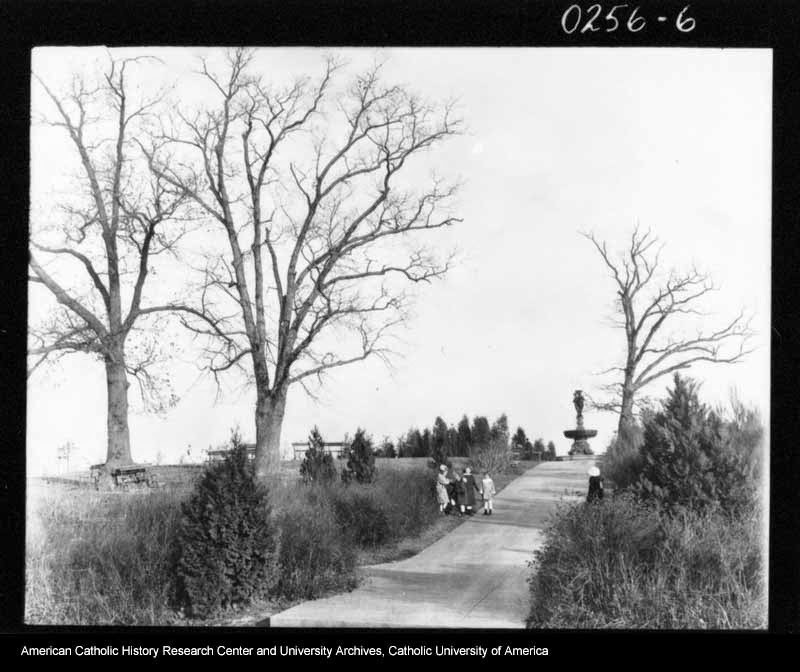 The Washington Aqueduct system was believed to be sufficient for the future water needs of the city, but by 1902, it was no longer adequate due to population growth and the need for a filtration system to treat the heavy sediment found in the Potomac water. A site was chosen for a massive sand filtration plant next to the Washington City (later McMillan) Reservoir, and construction began in the spring of 1903. The plant itself was designed by Lieutenant Col. Alexander M. Miller, who had begun to experiment with various types of slow sand and mechanical filters to purify the water supply being delivered to thousands of city homes. He had recommended mechanical filters, which was met by resistance by the Washington medical community, and a compromise was reached in which slow sand filters would be used, to which a coagulant was added during times of high turbidity in the water. The complex, eventually renamed the McMillan Reservoir and Slow Sand Filter Plant, consists of a pumping station for raising water from the reservoir to the 29 massive underground, natural sand filter beds--each consisting of about an acre of surface area, a 15 million-gallon filtered water reservoir, a pumping station with three centrifugal pumps, various boilers, and a power plant. Each of the sand filters consists of about 40 inches of sand supported on 12 inches of gravel through which the water flows. The combined capacity of the filters produced about 80 million gallons of purified water each day. One of the challenges that emerged, however, was the cleaning of the sand filters. The first two inches of sand in each filter had to be shoveled and removed by hand, and then flushed clean by a reversal system of water, discharging mud into the city sewer system. The cleaned sand was processed in the large cylindrical concrete structures seen today above the surface of the sand beds. The cleaning structures are often mistaken for the sand filters themselves. Over 20,000 tons of sand were washed every year, and was eventually returned to the sand beds via subterranean carts pulled by donkeys. The sand washing process continued until mechanized washing machines were introduced in the 1920s. 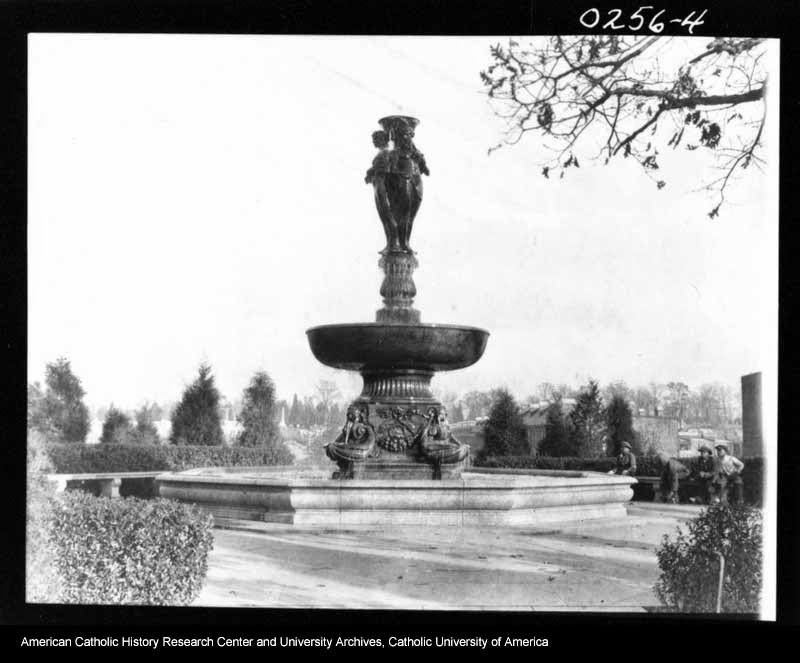 Earlier, in 1913, a McMillan memorial fountain was dedicated alongside the reservoir, both named for Michigan Senator James McMillan. It remained there until 1941, when excavation for a new clear water basin was required to serve the needs of a growing city population. It also served as the site of a battery of anti-aircraft guns throughout World War II. The complex continued to serve its original purpose until 1986; ownership was transferred to the city a year later, and the site has been abandoned ever since. The overall McMillan Reservoir site was designated a DC Historic Landmark in 1991. Due to its continuing deterioration, the DC Preservation League placed it on its “Most Endangered” list in 2000, and only recently have plans been discussed for its redevelopment.